Sitiawan colloquially refers to a collection of town centres in the district of Manjung, Perak. It includes the townships of Pasir Panjang, Teluk Penchalang, Dato’ Seri Kamaruddin, Sitiawan Town, Ayer Tawar, Serdang, Sungai Wangi, Sungai Ramai, Banjar, Changkat Chermin and Gugusan Lekir.Sitiawan reflects the cultural and ethnic diversity of Malaysia, and the area has been part of much of Malaysia’s modern history, from the impact of Japanese soldiers in WWII to the Malayan Emergency (1948 – 1960). Though not much in the way of tourist attractions, it is near the port of Lumut where travellers can board a ferry to the resort island of Pangkor. 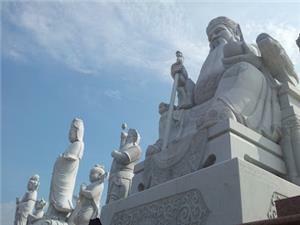 Sitiawan is primarily known for rubber, palm oil, mineral ore, fishing and ship building. In ancient times, the area was believe to be part of the Hindu-Malay Gangga Negara kingdom that collapsed in the 11th century. The area was a rich source of tin the late 19th century, and the main Dinding river served as a major waterway for steamships laden with ore, bound for Penang. Legend tells of a work elephant, overburdened with tin ore, becoming stuck in the river mud at low tide. Despite efforts, it could not be freed and was abandoned, save for its companion, another elephant who refused to leave until both perished in the rising waters. This impressed the hicks who named the place Kampung Sungai Gajah Mati (Village by the River Where the Elephants Died). A smallpox outbreak in 1886 convinced the superstitious locals to change the name to Setia Kawan or “loyal friend”, to placate the spirits of the elephants. Over time, this became “Sitiawan”. In 1903, more than 360 Chinese Christians from Fujian, China, consisting of Kutian, Hockchiu, Hockcheng and Henghua people (collectively known as Fuzhou) were settled in the area. Today, many Fuzhous in the surrounding area and major cities such as IpohÂ trace their roots to Sitiawan. World War II saw the arrival of the Japanese in the area, galvanising the local population into resistance, one of whom, the infamous Chin Peng, formed a Communist guerrilla army that not only fought the Japanese, but later the British colonial administration, resulting in the Malayan Emergency of 1948-1960. In recent times, Sitiawan’s economy has boomed, with the establishment of the Royal Malaysian Naval Base in nearby Lumut, as well as the settlement of swiftlets, whose nests are used to make the Chinese delicacy of bird’s nest soup. With prosperity came rapid and somewhat uncontrolled development, increased infrastructure and pollution to what used to be a sleepy village. Attractions are few and far in between. Some aspects of the old traditional ways of village life, revolving around feasts and festivals, are disappearing. Wooden early 20th century colonial style buildings are also vanishing under the new development. Opened in 2003, the Sitiawan Settlement Museum was established to preserve the history and artifacts of the Fuzhou settlers. It is housed in a converted 70-year-old church parsonage. Out the back is the well dug by the early pioneers for their water supply (now disused). Address: K6, Jalan Ling Ching Mi, Kampung Koh, 32000 Sitiawan. Tel/Fax: 05-6920612. Sitiawan has the Chinese Methodist Church, a small white building in the shape of a cross. Originally built in 1905, it was later rebuilt and renovated after a fire. The current setup dates from 1927 and is situated near the Sitiawan Settlement Museum. There is also Sekolah Menengah Kebangsaan, or known more popularly as ACS (Anglo Chinese School) that is over a hundred years old. It’s still a functioning school, and not as interesting as you might expect. To get to Setiawan from airport, one can take Star Shuttle Express bus from KLIA2 to Setiawan with only 2 to 3 hours bus ride. 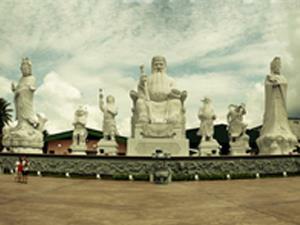 Hockchiu culture figure prominently in Sitiawan, especially Kampung Koh. Red rice wine (“mien siang”), kong piang buns, and sweet and sour fish maw soup (“goroow”) is part of the tradition. For more information about Bus to Sitiawan, check out details from us today!